On October 24th, SAP announced that its real-time intelligent enterprise resource planning (ERP) suite, SAP S/4HANA, has reached an important milestone – 1000 customers are live. Today, we are happy to announce the release of SAP Activate Methodology for the maintenance of the SAP S/4HANA solution. Its purpose is to help customers who have started with previous SAP S/4HANA releases (1511 or 1610) who want to transition to a higher release level. Users of the SAP Roadmap Viewer should use the tag filtering capability to select the appropriate scenario for their situation and the tool will then show only the activities and tasks relevant for their chosen approach. The “Maintenance Roadmap for SAP S/4HANA” is following the structure of the “Transition to SAP S/4HANA” implementation roadmap with project phases and work streams. Both implementation roadmaps follow the SAP Activate Methodology and same taxonomy. Each, in the overview image of the roadmap (deliverables by workstream), represents an activity which needs to be executed in the project as part of a certain work stream, and within a certain project phase. Each phase is completed with a Q-Gate to move on to the next subsequent phase and ensure all activities have been closed out and validated. 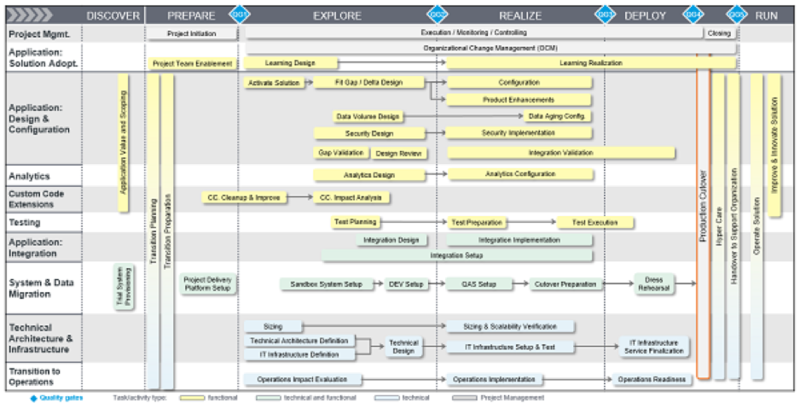 You can see the overview of the implementation roadmap in the image below. The new features of SAP S/4HANA that shipped with the latest feature packs and upgrades are documented in the SAP Online Help portal in the “SAP S/4HANA What’s New” section and in the “Feature Scope Description” of the relevant feature pack. The customer should decide, at a very early state of the planning, if he or she wants to make use of new functionality and plan preparation steps accordingly. SAP strongly encourages customers to take the opportunity of including the implementation of functional enhancements during their upgrade project. If you are interested to learn more about this new implementation roadmap, you can access it in the SAP Roadmap Viewer here. We look forward to your feedback in this blog using the comment feature below or on our SAP Activate community on Jam. Our team looks forward to the next update to provide you with the latest information and content! To stay informed about the latest updates to SAP Activate Methodology for SAP S/4HANA (both Transition to SAP S/4HANA and Maintenance Roadmap for SAP S/4HANA), be sure to follow @PKloess on twitter. For additional details about SAP Activate, you can find previous blog posts in the SAP Communities space with tag #sapactivate, and will also be announced on the SAP Activate Methodology Jam group, request to join here, where a community of 21k members are already actively engaged.